Physicists, says Randy Ruchti, are driven by the great questions. The importance of fundamental science for us is in our bloodstream,the 31-year veteran of the University of Notre Dame physics faculty reflected last month during the earliest working days of the Large Hadron Collider (LHC), the massive new particle physics facility at the Center for European Nuclear Research (CERN) that straddles part of France and Switzerland. Were rewriting the book on physics at this laboratory, he said. 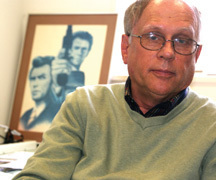 In his Nieuwland Hall office, a poster of Clint Eastwood asDirty Harrylooks over Ruchtis shoulder. It is the most unlikely icon for a scientist whose demeanor is serene and whose patient perseverance in creating and sustaining research opportunities seems not to have been tried by some monumental dead ends and setbacks. Switzerland is a long way from South Bend, compared to the Fermi National Accelerator Laboratory (Fermilab) in Batavia, Ill., where Ruchti and collaborators have long participated in the DZero experiment. With the advent of the more powerful LHC, Fermilab will discontinue the DZero experiment in two years time. Since Ruchti teaches, works with graduate students, and recently became associate vice president for research, his chances of becoming a jet-setting researcher are limited. Regardless, the Notre Dame Particle Physics Group has several Notre Dame graduate students, a postdoctoral fellow and a full-time research assistant professor working on-site at the new facility. Before LHC construction began, the U.S. scientific community harbored hopes of building the next major accelerator, and Congress seemed willing to help. In the 1980s, Ruchti and his colleagues first campaigned for the next great atom smasher to be constructed at Fermilab. A proposal for a giant facility in Texas won the bid instead, and construction began on the Superconducting Super Collider in Waxahachie, near Dallas. Then, in 1993, government funding priorities for research shifted and the project was abruptly halted simply discontinued after the expenditure of some $2 billion but before construction could be completed. There would be at least a 15-year gap before physicists and, more importantly, doctoral candidates, could test their increasingly complex theories in a suitably advanced facility such as LHC. After the loss of a major multibillion dollar project, you don't know how a field is going to continue and grow, Ruchti said.I needed graduate students and undergraduates to work with me on these projects.But there was no way to start students on a project in the 1990s when they would not be able to get data from it until the 2000s. Thinking about this issue in 1996, Ruchti says his solution came in realizing that his wife, Peggy, is a very smart woman. For years she had been encouraging him to start a community outreach program that made science accessible and exciting to young people. He realized that the students who would be doctoral candidates when the LHC opened were barely teenagers. The light bulb thought: You have to start reaching middle school and high school age students so they're coming up the chain to help on out a big experiment. For this upcoming group of students, the science is going to be fantastic, Ruchti said. Thus was born QuarkNet, a national program that engages teachers in immersive experiences in particle physics. The teachers are then catalysts to engage and inspire their own students. And we (professors) would get to learn about master teaching, which they know how to do, Ruchti said. Even if all these engaged teachers and students never entered the research pipeline, they're going to be voters: they're making an informed decision about why science and technology should be supported, he added. Now in its 10th year, QuarkNet engages 500 teachers a year in programs across the country, including the one still based at Notre Dame, located in a former grocery store on Eddy Street. An additional 100 high school students across the country also do summer research projects through the program. And the project benefits from the participation of 150 particle physicists who act as scientific mentors for the teachers and students. QuarkNet is directed by a colleague at Fermilab, Marge Bardeen, director of Fermilabs Education Office; Notre Dame particle physics faculty Mitch Wayne and Dan Karmgard; and R. Michael Barnett of Lawrence Berkeley National Laboratory. Has it been worth the wait? Observe how animated Ruchti becomes when discussing just two possible fundamental questions that collider experiments might answer. One is the nature of mass at the subatomic level. The other is the true nature of gravity, which may be functioning in dimensions not yet identified. If current theories are verified, there will be some new physics books indeed. Originally published by Gail Hinchion Mancini at news.nd.edu on October 29, 2008.